Just because you have a marketing budget doesn’t mean you have a marketing plan. To make the most of your dollars you need to have a 2019 strategic plan. 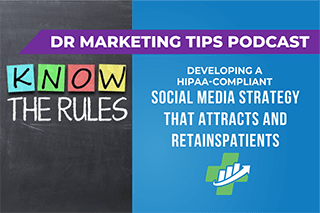 Sure you want new patients (who doesn’t), but are you equipped with a proven roadmap to help you reach that goal and ensure your practice is ready to accommodate increased patient flow once it happens? 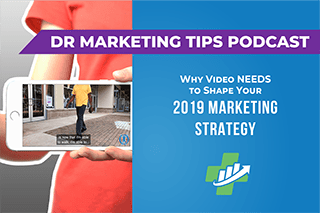 As you prepare your practice marketing plan for 2019, there are some real opportunities for you to take advantage of what we do best and implement it into your own strategy. Join us as we take you behind the marketing curtain and unveil our strategic action plan from A-Z when taking on new clients. We’ll also break down how our extensive competitor analysis provides you with real opportunities to increase market share. Announcer: Welcome to the Dr Marketing Tips podcast. Your prescription to the answers you seek to grow your medical practice easier, better, and faster. 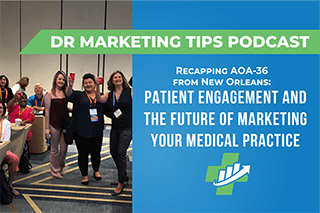 This show is all about connecting practice administrators and medical marketing professionals with peers, working in practices, learning from experiences, making mistakes, and sharing successes. Let’s get started. Corey: Hey everybody. 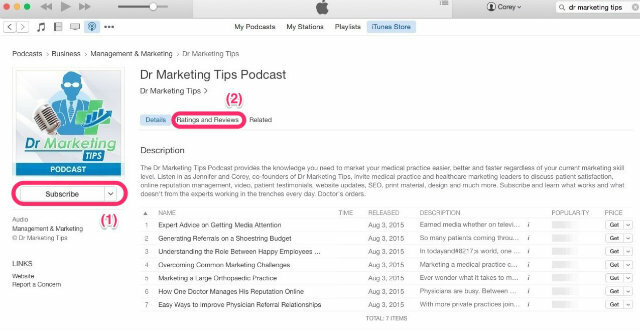 Thanks for tuning into the Dr. Marketing Tips podcast. I’m one of your hosts, Corey. Corey: And today, we wanted to take you behind the curtain a little bit and talk about what we do when we bring on a new client. 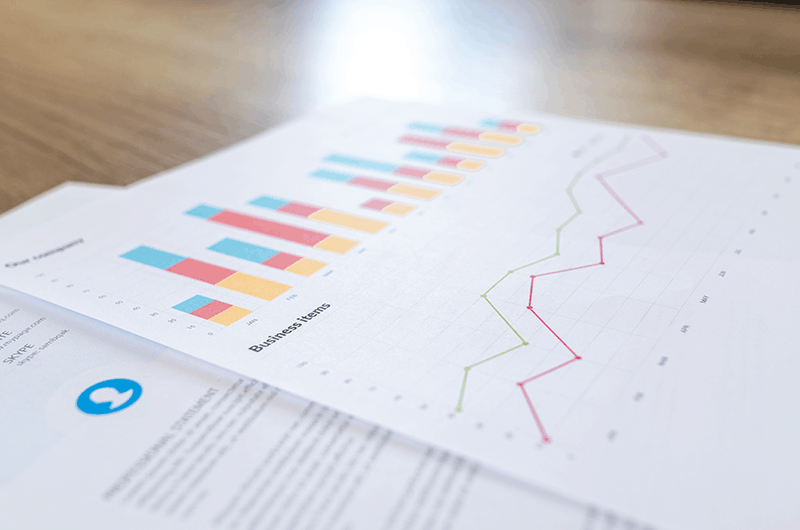 And one of the things that we do is we actually create a competitor analysis document and it outlines their strengths, their weaknesses, opportunities threats, goals, all kinds of fun stuff. So what we wanted to do was walk you through each part of that document using a real client, one of these ones that we just put together, and let you see how we come up with a strategic plan. Jennifer: Absolutely. And I will say this, we’ve had the marketing company since 2006, and we didn’t always do these competitive analysis and strategic plans upfront like this, but for the last couple of years, we have been, without fail, taking the first 30 days of a new client to really come up with the strategy and get it in writing. 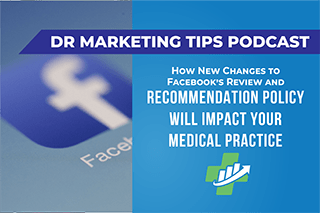 And that’s because we found historically that when you have maybe some physicians that aren’t 100% sold on the marketing of your practice, and why you need to spend this much money to be effective to go out there and get new patients and bring them in. Jennifer: and then everybody is on the same page when you’re going out there and you’re … It helps you, when you’ve got people coming to you and asking for dollars, it helps you stay focused on where you’re going to spend dollars, if it’s not of the strategic plan and not part of the ‘why’, then it’s very easy for you to say no. So it helps keep you on pace. And so, like Corey said, this is the first thing we do with new clients, and as you’re getting your plan together for 2019, I think that there’s some real opportunities for you to take what we do and implement it into your own strategy. Jennifer: So would that, Corey, we’ve got a table of contents, let’s just touch base on some of this stuff that goes on within some of the things that we include in the document and walk through some of the highlights. And then, if anybody needs help, they can always reach out to us. Corey: Absolutely. One of the first things that we always lead with is the collective review and goal. So essentially what this is, is it’s almost a breakdown of what we’re looking to achieve, so the goal for the practice. For the example that we’re looking at here, we’re going to call them HOF. HOF was looking to increase their patient count by five to 10%. So that’s great because that’s how we’re going to measure success. We know that if we can get a five to 10% increase in patients, which we know is 100 to 220 folks per month, then we are good. And that means we’re right on track and it’s right on this piece of paper. So there’s no questions. Jennifer: Absolutely. And part of our initial onboarding document ask a new client these types of questions. We also know that HOF, not only do they want a five to 10% increase in patients, we also know that they want to launch telemedicine services this year. We also know that they really want to increase one specific type of patient because if they increase that type of patient, they will be able to partner with one of the larger hospital systems and become part of the trauma center, and some other things that are tied to it. And so, there’s other opportunities. Jennifer: And so I think it’s important to understand the why, and not just the number that wants to go. But like Corey said, whenever there’s a chance to quantify a specific goal, then we’re going to measure everything against that quantifying number. Corey: Yeah, absolutely. So on this collective review in goals page, we’re looking at where we want to achieve and then where we’re going to promote that presence. So what we do is we say, “Well, let’s see, there’s four offices, they’re in these areas, so we know that we’ve got a 10 mile radius basically around each office that we’re going to focus on,” which is really helpful when it comes time to do any targeted digital ads, or if you’re going to buy something in a magazine or whatever, you want to make sure that you actually know where your target area is, and then what publications are in there. Corey: It sounds silly, but just having it written down on a list can really make a big difference. Jennifer: Makes a big difference. Especially if you take the time to put it up against the map and then draw circles around the map over the locations. Because then you’ll know what makes sense for you to spend dollars on and what doesn’t. I think the next piece of that is, it’s one thing to say you a five to a 10% increase in patients, but you have to understand, what does that five or 10% increase look like? Because we know exactly dollar for dollar what it’s going to cost to get new patients, and if that’s 2,000 new patients per month, then it’s probably going to take you three to $10 per patient to acquire them. Jennifer: And so you have to understand what’s behind that five to 10%. For HOF, it’s 100 to 220 new patients. Corey: Yeah. And something to consider there too that kind of relates to marketing, but I think it’s important to say is, and we’ve seen this with practices that we work with too, is they’ll bring us in. They want to increase their patients, so let’s say we want 300 more patients a month. Well, that’s great, but you have to have the admin side on board with that as well because we’ve seen that work against them where all of a sudden there’s more patients, but there’s a problem with patient flow, and then you wind up with more upset patients. And then you shoot the marketing in the foot because suddenly everyone’s going online to leave negative reviews. Jennifer: Absolutely. It doesn’t sound like you haven’t just gone through this. 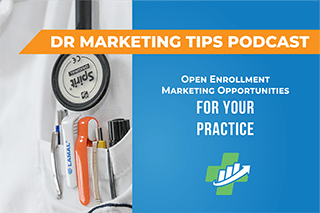 Jennifer: Well, and I think it goes back to … We were at a conference a couple weeks ago with a bunch of practice administrators, and it kept coming up that marketing and marketing your practice in general is not something that operates in a silo. It’s a team sport now, and it’s a team sport because you have to understand there’s an ebb and flow to everything, and every action has a reaction, and everybody has to be on the same page. Corey: Absolutely. Couldn’t agree more. Corey: Yeah, it’s really interesting just to see where you stack up because you may think … So for example, we’re looking at this HOF document, and one of the things that we compare against their three closest competitors, are expected website traffic for the previous month. So it was interesting to see, you would think that one clinic, maybe they’re like the big player in town, but they actually have a lower website traffic or visitors than you would anticipate. Maybe a smaller practice is larger, maybe you’re at the top, and that’s not translating or vice versa. Corey: So just again, having it in the table, I think it does a really great job to illustrate where you are and how you can improve. So on this competition at a glance page, we also talk about traffic from any Google ads, if that’s something that you’re doing, backlinks, keywords that are actually in the search engine. So, how many different terms are you showing up for? And again, as we’re looking at this, we’re comparing across three closest competitors. We also look at primary social channels. So we’re looking at what the engagement is for each practice, how many fans they have, their following, how many views on YouTube. Corey: And then also review. So at a glance, looking at their online reputation just to see what the ratings are in contrast to your HOF. Jennifer: Absolutely. And the next thing that we dive into is really taking a look at the website and how your website compares to your competitors. So we look at things like backlinks and keyword rankings. But we also look at your home pages, because the homepage is for the most part and I’m still be your number one page on your website. And we’ll look at the list of services and the things that your competitors they’re focused on, versus maybe what you’re focused on. And this helps really set the stage, especially for your providers, the ones that we’re trying to get on board. Jennifer: If your competitor down the street is focused on radiology and imaging services and spa and the aesthetics, but you’re actually focused on vaccines or infertility treatment or menopause treatment, you all are going about it differently, and then it allows us the opportunity to dive in to see where there are opportunities to increase market share for the client. Corey: And I think it’s interesting too, because not only does it compare what they’re focused on, but just having that full list, we’ve seen it with practices before where they’ll go, “Well, I didn’t even think about putting the fact that we have extended hours on there,” or whatever. Like they don’t even think to market those things, but if we put a little X next to it and say that, “Oh, this competitor down the street, they have a big section about,” whatever, then it makes you go, “Oh, well, maybe we should have that too. And I wonder what else we have that we don’t talk about.” And so it’s a good conversation piece. Jennifer: Absolutely. Then the next piece that we would do is we dive into a little deeply with the actual competitors themselves. So where the previous page might’ve been us talking about, from an at-a-glance, from 40,000 feet up in the air, then we dive into the competitors. Then we dive into the competitors, and we specifically grab screenshots of their website so that we can look at what their websites are doing so that the physicians can see that visual. And then we look at their About Us, the things that are general. We look at their specific doctors and see how their doctors are listed, whether anywhere online. Jennifer: And then the negative for this one in particular, they’re really focused on customer service issues and just talking about just overall disappointment. And so that allows us the opportunity, strategically, where we’re more looking at how we might position HOF, if we know their biggest competitor has a terrible reputation for customer service, then we’re going to really lead with that customer service message, and it’s just … This is where you start identifying opportunities and it doesn’t … These ideas and identifying these opportunities do not come unless you put pen to paper and really start looking at what your competitors are doing. Corey: If they’re a very large clinic, do they get a lot of internal referrals or do they not have any referrals at all because then we’ve got a weakness. We’ll look at things both on the digital front and on the traditional front, in addition to how well their website performs, but also does it have the latest security features? Are there reviews? Are they consistent or was the last one they got six months ago? And all of these outlines the plan that we’re going to put together. Jennifer: Absolutely. And I think some of this may sound daunting, but there’s a lot of tools out there that are free that allow you to run your competitors through whatever the algorithm is and get these information for yourself. You have to pay for more of a deep dive, but there’s a lot of out there that you can do yourselves. When we put these documents together, we track all of our time. We’re looking on our side, it usually takes us somewhere between 40 and 60 hours to ramp up this as a project. And so the first phase for us is always sitting down, looking at the competitors, coming up with a document and then moving forward from there in some persona exercises and things like that. Jennifer: There’s a lot of research that goes into truly doing a competitor analysis, and coming up with a strategic plan, but it is time that is so well spent. It pays dividends down the road. Corey: Yeah, absolutely. Moving on from the SWOT, the next thing we do, again, we’re just looking at one competitor compared to HOF, is we do what we call a site performance snapshot. And essentially, it just compares site metrics from one website to another. So we’re looking at things like domain authority, which is something you may or may not have heard, but basically, it just means if you have a higher number there, you’re more likely to show up when someone searches for something. If you have a low number, you’re probably not going to show up. Corey: It’s interesting to see those numbers side by side. Again, because if you have a low number then that tells us that from an organic content strategy, we need to lean into that and really focus on it because that’s going to bring that authority number up. And once we do that, you’re going to start to show up more, and as you start to show up more, you’re going to get more patients. Jennifer: Absolutely. So we’re looking at the SWOT for HOF, and we immediately see that there’s an opportunity or a strength when it comes to they’ve got a Spanish speaking or Portuguese speaking physician and they’re in a very high area for Brazilian population. We think it’s a strength that they are literally starting from scratch because they’ve never really tackled the online marketing. And so there are literally starting from scratch and we’re going to be able to make a big presence all at once. And we wouldn’t have really identified those had we not looked at it against their competitors first. Corey: Yeah. They say that they had a website, but I wouldn’t call it that. Jennifer: No. That one wasn’t a website. Corey: Yeah. It really gives us a real opportunity, I think to promote that patient for results driven message because again, going back through the SWOT, we know that their competitors are not doing that. So as we’re putting together, not only what their marketing message is going to be, but really like Jen said, we’re starting from scratch with them. So whether it’s website, social media, any sort of printed collateral, anything like that, we know that from the get-go, this is where we want to focus on because we have this document. Jennifer: Absolutely. And so the next piece, after we’ve analyzed, first you analyze at a glance, then you analyze in depth your competitors and then you really take a look in the mirror and analyze yourself. Once you’ve done this full-on competitor analysis, the next piece is to put together a true strategic marketing direction. And so for HOF, we outlined just two strategic directions for the next year. And it’s the compass to everything that we’re doing. It helps keep us pointed in the same direction. And so for them, we’re going to develop branding focused specifically on a patient forward, results driven messages that differentiate them against their competitors. Jennifer: And the way that they’re able to differentiate is because we’ve gone in and done a deep dive so we know what other people are saying about their competitors out there, and we’re going to say the opposite. We’re going to make sure that if they’re complaining about … If patients are complaining about the billing department and the lack of customer service, that we’re going to deliver better customer service and really lead with those very positive patient outcomes. That is why we’re going to do it. Corey: And as we focus on these differentiators, things like number of patients helped, reviews, testimonials, videos, those kinds of things, everything that we do, all of the branding leans on their social proof idea and their wealth of past patient success stories. And that in turn creates strong calls to action and it helps create future conversions. And like you said, it drives the marketing message. Jennifer: Absolutely. And for this one, HOF is a women’s clinic. And so we know specifically they want to reach a certain patient count, like I mentioned before, so they can tie in with level two neonatal native intensive care unit that is within the community as well. So we know that first and foremost, our strategic direction is going to be that we’re going to focus on patient, the patient forward strategy and we’re going to do that because of everything we’ve already mentioned, but we also know that there’s a secondary strategy and that is to get new patients in the door, so we can reach that level two neonatal status. Jennifer: And so understanding that, having this blueprint for how you’re going to achieve your goals, you have to understand the ‘why’, and that’s part of the big ‘why’ behind it, is that second strategic goal for them. Corey: And then from there, we close out the document by saying, “Okay, so now we’ve got all this great information, what are the immediate next steps?” For each of the recommended strategies that we want to do, we outline four or five things that say, “Okay, so we know that we want to go into patient forward strategy, so what are we going to do to get there?” Well, we’re going to finish the new website, we’re going to claim some profiles, we’re going to update the practice material, we’re going to start the branding and just mow down this list. And as we do that, we’re going to build this brand. Jennifer: Absolutely. And I think that once we create the document, we have several meetings that go around the creation of the document, then we typically provide it to the providers and outline our plan and that’s where we get the thumbs up or thumbs down. Corey: Yeah. They really like that immediate next step part too. Jennifer: Absolutely. Before we go, why don’t we just really quick touch on the patient personas and how that plays into this mix. Corey: Yeah. So part of what we do is we also create what’s called patient personas because we know that as we create marketing material and marketing messages, we’re talking to different folks. For example, with HOF, one of the potential patients may be someone that’s 35, 36 years old, she’s ready to have another child, whereas another potential patient could be 18, and another potential patient could be 75. And because they provide care through a lifetime. So each one of those personas, it’s a very different message that we’re going after and it’s a very different targets. Corey: By having these things again, identified it on paper, as we start to move through the strategic process and giving up the budget, we can say, “Well, we know that, we want to focus here, here and here, because that’s a patient population we want to grow essentially. Jennifer: Absolutely. And those patient personas are another piece that you add to your strategic document, that are great for when somebody that’s doing your marketing, gets promoted to another position. It just means that everybody is on the same page moving forward. And it’s a great thing to revisit at least once a year, if not more often than that. So if this is a little daunting to you, it’s a very big project, but it’s a great project to do for the fourth quarter as you’re getting ready to lay out your plan and get everybody on board for next year. Jennifer: And if you need some help, by all means, reach out to us. We do these all the time and we’d be happy to have a conversation with you about doing them for your practice as well so that you just get the document, we’ll tell you what you need to do and then you’ll go out there and knock it out next year. With that, I’m Jennifer. Jennifer: And we’ll see you next time on the Dr. Marketing Tips podcast. Announcer: Thanks for listening to the drmarketingtips.com podcast. 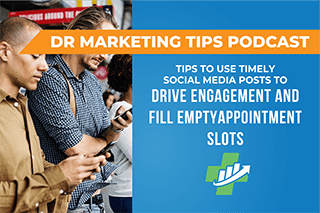 If there’s anything from today’s show you want to learn more about, checkout drmarketingtips.com, for our podcast resource center, with all the notes, links and goodies we mentioned during the show. If you’re not already a subscriber to our show, please consider pressing the subscribe button on your podcast player, so you’ll never miss one of our future episodes. And if you haven’t given us a rating or review yet on iTunes, please find a spare minute and help us reach and educate even more of our medical practice peers. Announcer: Thanks again for listening, and we’ll catch you next time, doctor’s orders.